Happy Monday! I'm still making a Chinese New Year theme for bento. I chose to make a girl with lantern. Lantern is one of the decorations that we often see in houses and shopping centers during the Chinese New Year. So I think this bento is appropriate for welcoming Chinese New Year. Today's bento was pretty simple. I only put sauteed minced pork with potato and scrambled egg on the top of the rice. Added some steamed kabocha slices at the top. My sister and her family will arrive in Jakarta this afternoon. We are excited to meet them all. Kids have been excited to meet their first cousins. And I can imagine the whole house will be so noisy later. cute lil gal wearing cheong sam and red boots..so cute and festive. I cant wait to dress up my baby gal coming CNY..
Oh my gosh Lia, this bento is just beautiful!!! You are always so amazing! Aw,your Chinese girl looks fantastic! So cute and so much details. Really great! This bento girl is too adorable! I love that rice textured background too.. Great fun! Have a great time with your family Lia! Wow this is really cute! 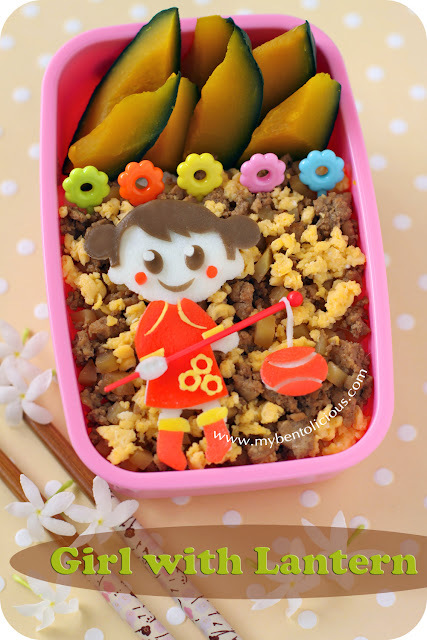 lucu bangeuttttt.... amazing bento as always..
Lia, ada yg mau ditanyain nih: eggsheet bisa brp lama tahan di lemari es ya? cara penyimpanan yg baik gmn? thanks ya.. Lia!!! It's just tooooo cute! You're super creative! @Uniflame : Thanks a lot Cynni! @Ju : Thanks a lot Ju! Gong xi gong xi! I love all ur charaben. My wish is to see ur work in the making so I can learn frm the master n make the coolest charaben for my girl! Super fun your folks are coming today, so exciting! Hope you will have a great time and give a big smooch to the twins! The Lantern Girl is adorable! I'm always so envious of your cutting skills! @Jessica : Thanks a lot Jessica! Only one word to describe: Amazing! Have a wonderful time with your sister! I love your lantern girl!!! I can't even imagine how you cut those details. It's wonderful! prince n princess mum : Very kind of you to say that. Thanks a lot! Simply awesome...and sweetly beautiful Lia!! Her expressive happy face made me smile, as did her cute little outfit! This little girl is beautiful ! I really like her face and the flowers on her dress ! She is so pretty!! I really need to catch up with your blog, I can't believe I miss out so many cute bento!! @Juliglups : Thanks a lot Juli! @Linsey : Thanks a lot Linsey!